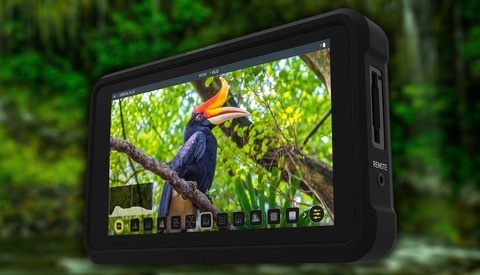 Aimed at DSLR filmmakers looking to invest in a larger production kit, the Blackmagic Video Assist 4K is a seven-inch touchscreen monitor that doubles as a video recorder. I was able to use the Video Assist during several shoots last month in Chicago, and I’ll go over the features, build quality, uses, and talk a bit about pricing as well. I should note that there are two models of the Video Assist: a five-inch HD-only version, and a seven-inch Ultra HD version. This review will be on the Ultra HD version. 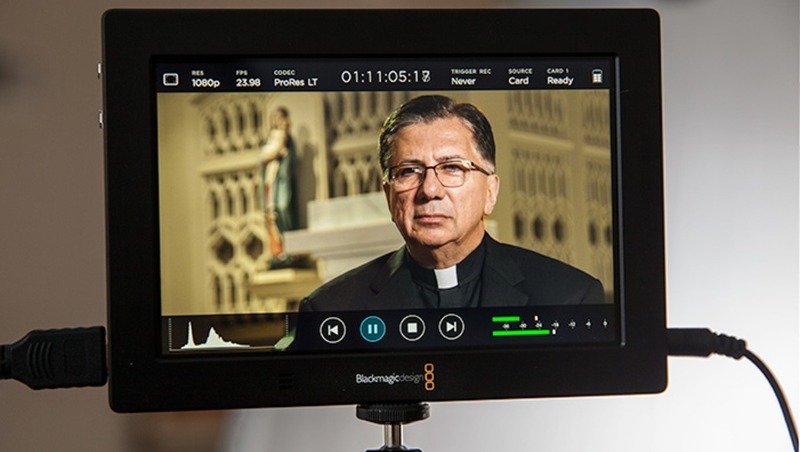 Blackmagic Design is known for their affordable, high-resolution digital cinema cameras, but they have actually been around long before they started making their own cameras. With roots in postproduction hardware and engineering, they made their first big impact on the industry in 2002 with an affordable capture card for Mac OS systems, and have been going strong ever since. Now the company offers an array of products, from DaVinci Resolve to converter boxes and encoders. Right out of the box, it’s obvious this thing is built like a tank as it is machined aluminum. The listed weight is 1.75 pounds, so while not terribly heavy, it is a touch more so than your average on-camera monitor might be. You’ll always want to be sure it’s completely secured when mounting. 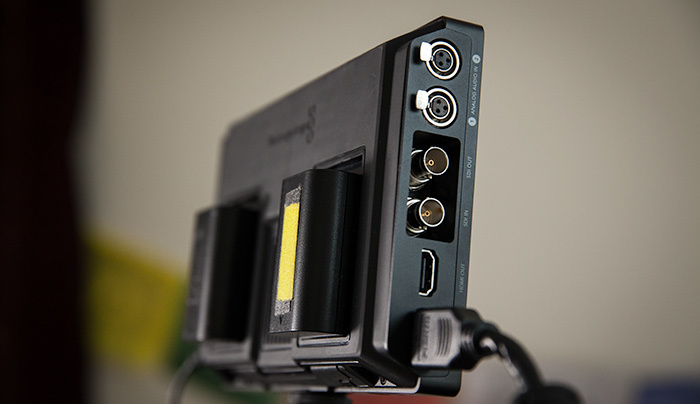 The Video Assist 4K can be powered by two hot-swappable Canon LP-E6 batteries, or plug in AC power from a six-foot power cord. There is a fan on the back that makes a small amount of noise, but in my experience that noise was not an issue. 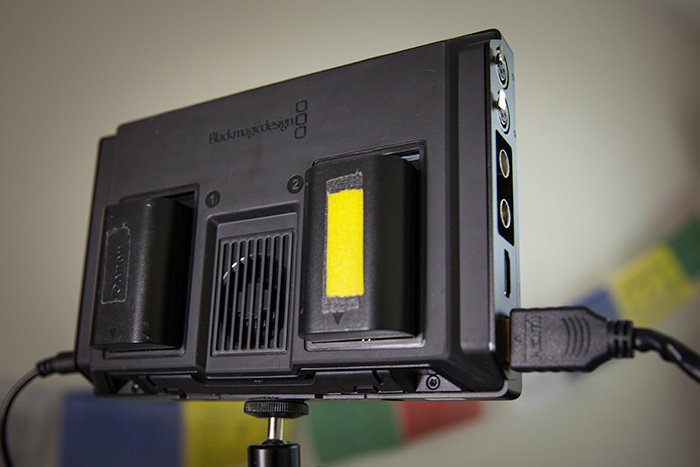 If you chose to record only from a camera-mounted mic however, then it might get picked up. There are ports for headphones to monitor audio, and a LANC port for record control. One small feature that I almost completely overlooked, and then couldn’t figure out what it was for, was a small flap on the bottom. Turns out, it’s basically a kickstand; you can turn the flap out and the monitor will stand on its own on a flat surface. It’s such a basic thing, but all of those little details really add up. There are three ¼-20-inch threaded holes on both the top and bottom sides to use for mounting points. A noga arm would work well, but on my shoots I found that it was easy enough to use this cold shoe adapter with a mini ball to secure the VA4K in place. 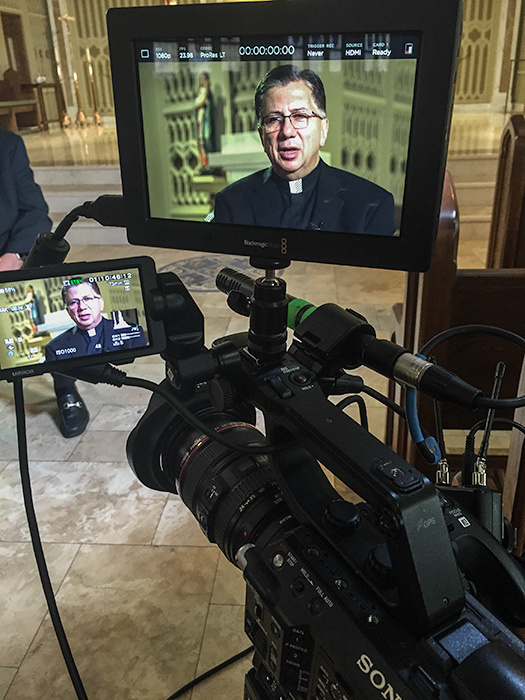 During my shoots, I used the Video Assist 4K with a Sony FS5, FS700, and then later I tested a Panasonic GH4. In every case I connected them with a full-size HDMI cable (the GH4 has a micro HDMI port, so I needed a cheap cable adapter off Amazon). If you need to send an external audio source or backup mic signal to the VA4K, there are mini-XLR ports and BMD sells an adapter. The video displayed plenty bright for indoors, but as with any monitor being used outside, you’ll want to use a hood under the midday sun. As of my review, Blackmagic does not offer a sun shade or hood, but you can fit other brands or make one out of black foamcore if needed. The 1920x1200 pixel touch screen was responsive, and provided a sharp representation of the image I was capturing. Monitoring tools included customizable zebra stripes, focus peaking, grid overlays, histogram, false color and even its own zoom magnification for checking critical focus. At times I had to keep an eye on two different cameras, and the large screen meant I could easily check things without having to stand next to that particular setup. There are controls for brightness, contrast, and saturation, but as of version 2.1 software for the VA4K, there are no other calibration controls. Having some color channel adjustments might be asking too much for a sub-$1,000 monitor/recorder, but the image on the monitor did appear a touch more warm than my cameras LCD/final image. What's going on under the hood of the VA4K is that it's measuring the signal being sent over HDMI/SDI, while the camera measures internal raw sensor data. This might be where some minor discrepancies come in to play. The reality here is that the image displayed isn’t for grading, but rather to let you to check your framing, focus, and exposure on a larger screen. After using the monitor a few times and checking the resulting video files, I could see the image it displayed on screen was pretty darn close to my recorded file. For my shoots, I only used the VA4Ks recording functionality as a backup. Which leads me to its recording capabilities. The VA4K has options for the following codecs: ProRes proxy, LT, 422, 422 HQ, and Avid DNxHD(220, 145, 45), DNxHR (HQ, SQ, LB). Resolutions go up to Ultra HD (2160p30) and record in 10-bit color. Depending on your camera, it can record simultaneously, allowing you to do backup recordings as I did, or even record proxy files. While recording, I ran the VA off of full batteries for about three 25-minute interviews, and one battery died while the other was close to dead at that point. While I didn’t think the battery life was that great, I did appreciate that when plugged in to AC power, the batteries would actually regain their charge. At my hotel that night I charged both batteries off of the monitor, but there was no indication that the batteries were actually charging, so I powered the unit on to be sure (Blackmagic tells me that the batteries will in fact charge when the unit is not powered on). The recorded video files came out exactly as expected. I had lovely, ready-to-edit ProRes files. The files sizes were noticeably larger, as the AVCHD I’d normally get is pretty compressed, so having plenty of storage is a must. Smartly, the VA4K is set up to span files across SD cards so as soon as you fill one up, the other picks up where the first left off. Recording times will vary depending on your codec, resolution, and card size, but here’s a quick overview. The Blackmagic Video Assist 4K is listed at $895, and it is the only monitor under $1,200 that includes built-in recording functionality. 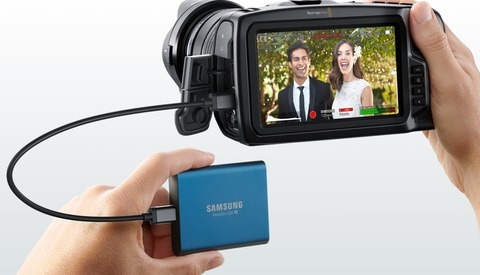 You’re basically getting a preview monitor and a recorder in one, without the extra features that a small to mid-level production might not need. 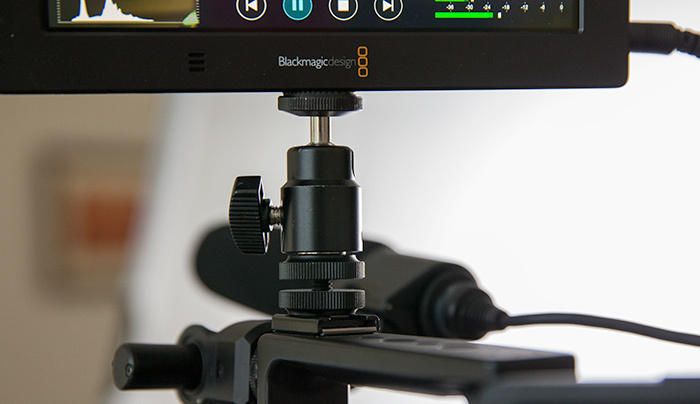 If you’re in the market for an on-camera preview monitor, and would like the peace of mind that comes with a backup recording, the Blackmagic Video Assist is a great choice. If you need more calibration control, LUTs, additional codecs or recording features, then you should expect to pay a few hundred more for that. For those DSLR and compact cinema camera filmmakers, this will fit in nicely to their workflow without breaking the bank. I've used it and the biggest deal breaker for me was that it literally EATS batteries FAST. So that means that you need to have a LOT of LP6 ready to go !! This is of course especially annoying if you're out in the field with no means to charge your batteries. Sorry Blackmagic, I love you, but just for that reason, I wouldn't buy it. It definitely goes through them! I feel like that's the price we pay for getting to work with smaller LP6 batteries though – higher capacity batteries could offer a longer operational time, but would add weight, bulk, cost, etc. Not sure that a lot of LP6 is cheaper that a V-mount with a D-tap to power nearly whatever you want. These values are simply not (not yet?) possible! BM testet only two 64 GB UHS-II SD-Cards and the rest was just simple mathematics. 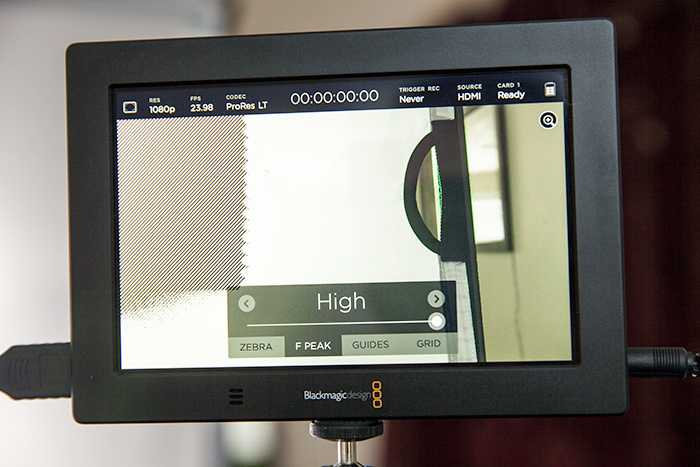 We tested two BMVA4K with two cards and found out that this card is simply too slow for 2160p24 (ProRes) at all. It is true that you can hot-swap cards, but this makes it less convenient to record e.g. a speech of 30 minutes. Think about recording a stage show with changing light situation. Can you swap the cards and adjust the iris at the same time? I probably can´t. 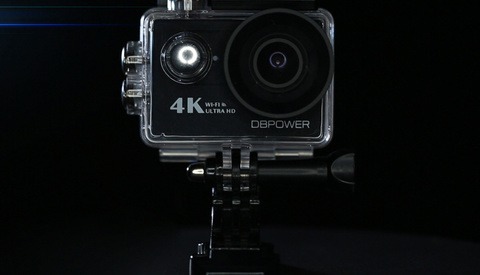 Right now (October 2016) I can only recommend the BMVA4K for recording less the 20 minutes with two of the recommended 64 GB cards. Let´s see if there will be more high capacity UHS-II cards soon. Anyway I really liked the build quality! Metall! UHS Two, I did a few test recordings with lower-speed cards, and actually was able to record 4K without one of the two cards noted, but I probably wouldn't trust it on a shoot. I don't own them, but will purchase some before I need to use the VA4K as a primary recording. Most of my content is finished in 1080p still, so backing up at that resolution is OK for my workflow still. It's interesting to hear about what you experienced though for sure. Have you tried to reach out to the BMD customer support about that? Sure, I have contacted the support, but I almost quoted their answer above. Maybe this is the reason for the cheap price of the BMVA4K in Europe: 550 Euro net.